Hey, hey, hey! (Did I just date myself with that What's Happening line?) 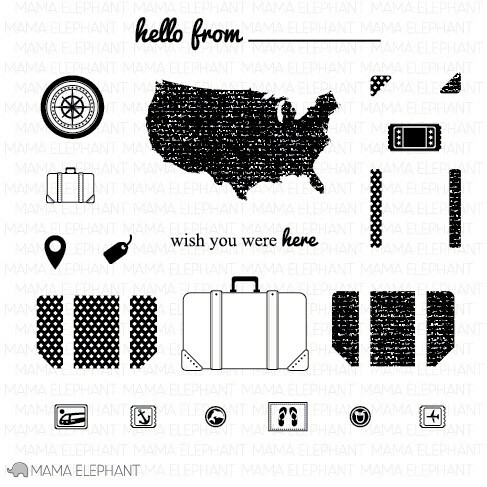 Today, we continue our journey through the October Mama Elephant stamp release! Hope you're having fun seeing these sets in action! The set today is Geotagged! I know you're already loving that large US map stamp and that adorable geotag, but there are lots more to play with! Today I did a super CAS card (shocker, I know;). I started by stamping some diagonal line borders on the base card (border stamp is from Basic Borders). The suitcase itself is made up of 3 stamps: outline, polka dot, and teeny tag. The pieces are super easy to line up by sight. What you don't know is that the suitcase has a secret! Open up the suitcase for a little XOXO (that stamp is from We Click). 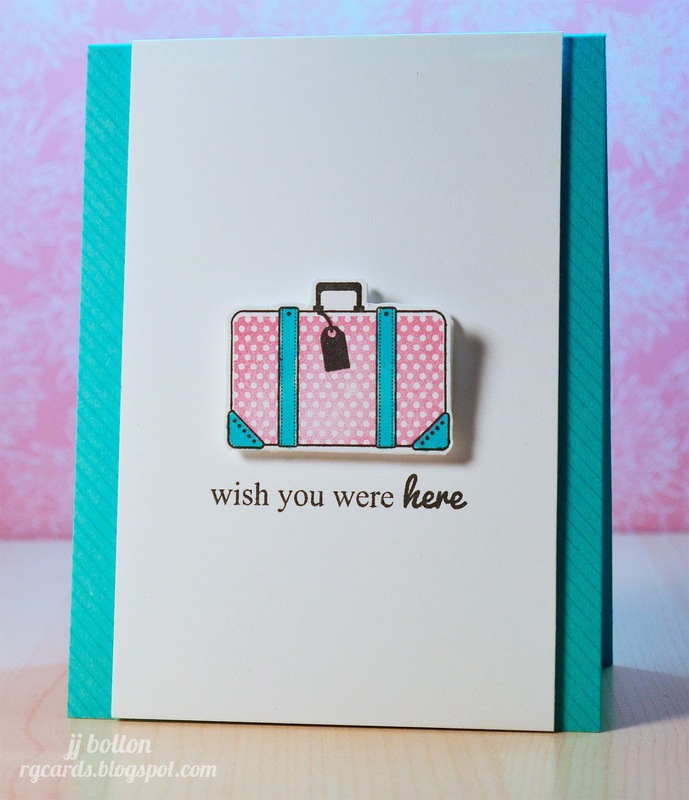 For the super secret suitcase, I stamped the suitcase image onto a piece of cardstock folded in half. The handles stick together with a little velcro. That's it for me today! Tomorrow I'll be showcasing one more set for the October release, but right now it's time to give the other DT gals some love! Enjoy! Love the pink & teal, too - such a fun combo! I was pleased enough wiht the card as it was, but when the suitcase opened up...well that was at another level! CUTE!! I love that the suitcase opens!!! Interactive CAS - leave it to you JJ! 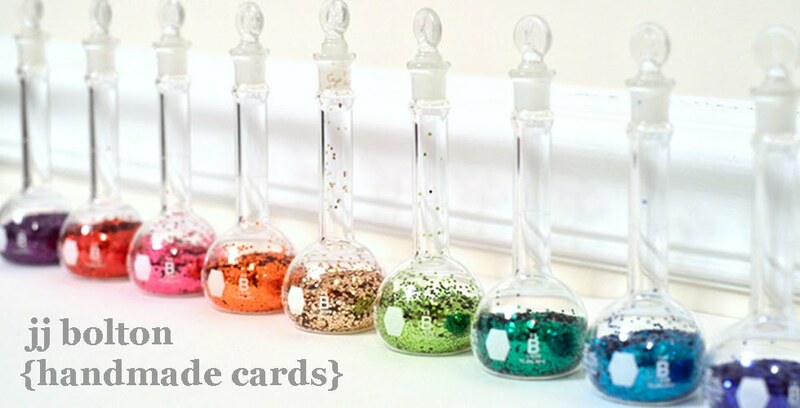 How cute is this card! I absolutely love it! Even though your cards are CAS you always manage to sneak a little twist in there. I love it!!!! How cool that you can OPEN the SUITCASE?!? OH MY! This is soooooo cute! I love love love it! I love the striped border---love that tag on the suitcase---LOOOOOOOOOVE that it opens! GET OUT! I cannot be on a team with you- I'm jealous of your talent-- you are SUPER x10 creative! LOVE LOVE LOVE! I have to find another synonym for clever because I say it too much to you! But this really is... love the secret message inside the trunk! Awww! Love the secret message in the suitcase! So cute!